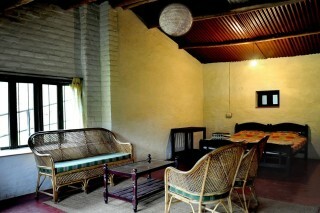 A UNIQUE stay/tour to a temperate farm situated 39 km away from Kodaikanal at an altitude of nearly 2000 mts (7000ft) ABSL bordering kerala (towards Munnar & 3 wild life sanctuaries) The drive from Kodaikanal (1 & a quarter hours) takes you through one of the most breathtaking & scenic views of south India of lakes, terrace cultivation, mountain villages and lush forest where one can sight Bison’s (gaur), Barking deer, giant squirrels etc depending on your luck & a host of beautiful birds like nilagiri laughing thrush, white eye, Bersa serpent eagle to name a few. Kodaikanal Road Railway Station, the closest railway station, is at a distance of 16.55 km from the property. Nestled on a quaint woody meadow, this classic brick cottage offers an independent stay in two spacious bedrooms, each decked with a cushy double bed, a cane sofa set with a glass-topped coffee table, an earthy rug, and modern bathroom facilities. The room is accessorised in contrasting rustic hues and furnishings such as sheer ivory-coloured drapes, a coffee-brown sloping roof, and white brick-textured walls. Outside, a traditional wooden column-lined veranda invites you to lie back on the cane chairs and enjoy a cup of coffee brewed from locally-sourced beans. Places to visit - Sheep Research Center - 7.7 km. Mannavanur Lake - 7.7 km. 80 Mile Round - 16.2 km. Kodai Lake - 41.0 km. Pillar Rocks - 35.9 km. Guna Caves - 35.1 km. Green Valley View - 37.7 km. It was THE BEST STAY of my life.....such a cute house. The nearest Railway station to reach Kodaikanal which is 80 kms and 3 hrs drive.